A post-apocalyptic mood settles over a picturesque snowy landscape that evokes the beauty of Japanese woodcuts. Time stands still. It is as if the landscape is frozen. A thin layer of snow covers the traces of the catastrophe that are still just latently visible. Plains scoured bare, on which coastal cities had earlier risen, remain in a moment of torpidity. Even a year after the tsunami the Tōhoku region still appears paralyzed. Through the unfathomable stillness the catastrophe is felt physically. “Even in the at-first innocuous photographs one feels intuitively an underlying tension, a kind of phantom pain in the places where people had previously lived and where their houses had stood,” writes Denis Brudna in a review of Hans-Christian Schink’s book Tōhoku. Standing on a hill above a cemetery one sees out onto the emptied terrain. The perspective is that of the survivor who was able to bring themselves to safety or who was lucky to live high enough up a slope. Drawing on strategies of romanticism, Schink’s imagery blends the horrors of natural dramas with an aesthetic pictorial composition and a vibrant expression of the sublime. The narrative potency of the vast landscapes is strengthened by a sensation that is a mix of fascination and menace. The eerie quiet after the storm appears deceptive, as if the sea could rise up again anytime. The water thrusts houses, boats, and cars like toy figurines forward and deposits them haphazardly in various inland locations. The giant concrete supports built by the coast guard are wildly, chaotically jumbled as if they were made out of Styrofoam; a red wooden Buddhist temple seems to be ripped from its foundation by a giant and left at the edge of a forest in one piece; a bus “parks” on top of a house; and a fishing boat lies stranded in the middle of a rice field. Indebted to the topographical style of Bernd and Hilla Becher, an evenly pallid light suffuses frontal, diagonal, or lateral compositions of remaining ruins of houses, which are captivating in their sculptural beauty. 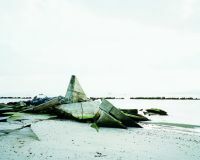 Interspersed between the extensive landscape panoramas these photographic inventories of destruction create a poignant lack of immediacy owing to the distancing view. In many of his earlier series Hans-Christian Schink dealt with the contrast between nature and culture, like in German Unification Transportation Project where powerful concrete highway structures dominatingly pave paths over rivers and through fields, or in the series LA where lonely asphalt roads in the outlying areas of the huge, spread-out city of Los Angeles eat their way into the desert. Here man is more powerful than nature, which falls victim to civilization. With the series Tōhoku Schink makes a U-turn and shows that it can also be the other way around. In comparison with his earlier visual constructions where the absence of people was a result of selection and perspective, here human life is obliterated through the brute force of nature. Nature takes back what humankind had tried to appropriate from it. During his 2009 artist residency in Niigita, Japan, Schink observed the technical efforts that man undertakes in order to tame nature. He took notice of the strengthening of hillsides for earthquake protection, the dense plantation of coniferous forests, the gigantic coastal protection walls to shield against tsunamis, as well as the idiosyncrasy of strongly regimenting plant growth to where even in the smallest private front yards the trees are trimmed, cleaned, plucked, swathed, and bandaged. Schink observes that “in Japan the effort to dominate nature is more strongly pronounced than in Western societies. At the same time there is a much greater acceptance that nature is more powerful and cannot be overcome by man.” He found the pragmatism of the population in dealing with the forces of nature remarkable and did not find that the tsunami threw society into disarray or had brought a shift in civilized behavior. 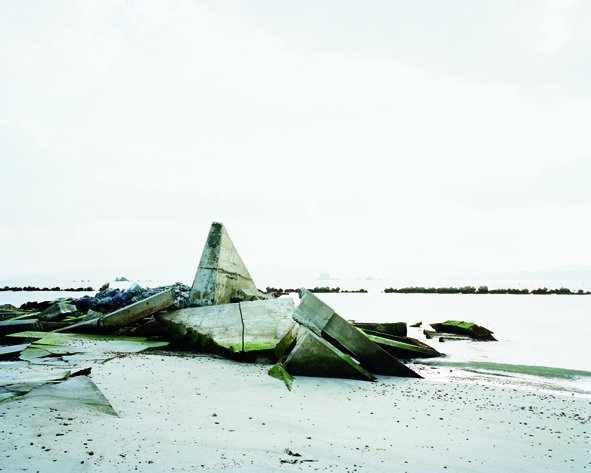 His soberly constrained photographs convey how Japan has learned to live with natural disasters. For him they are a sign of acceptance. The unreality and reverie that Schink’s images exude correlates to the numb feeling of a phantom pain. But there is relief. Soon one discovers tiny people in some of the photographs, like the surfer on a beach amid falling snowflakes. Though the signs are minimal, the message is clear: life goes on.